WHY BUILD, THIS HOME IS ABSOLUTELY IMMACULATE AND MOVE-IN READY! 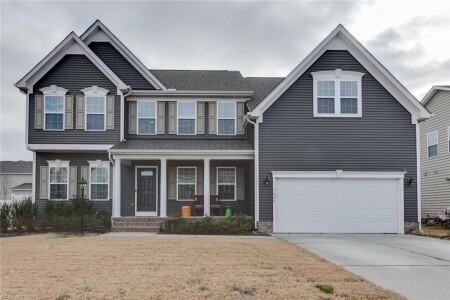 THIS GORGEOUS 5 BEDROOM HOME, HAS A GOURMET KITCHEN WITH GRANITE COUNTER TOPS, STAINLESS STEEL APPLIANCES AND A LARGE ISLAND THAT OPENS TO A SPACIOUS FAMILY ROOM. THE 1ST FLOOR BEDROOM CAN BE USED FOR GUEST OR EASILY TRANSFORMED INTO A HOME OFFICE. THE HUGE MASTER BEDROOM WITH SPA BATH AND CUSTOM WALK-IN CLOSET IS A HOME OWNER'S DREAM. THE VERSATILE LAYOUT PROVIDES ENDLESS FLEXIBILITY FOR ANY HOUSEHOLD. THE ROOM OVER THE GARAGE, WHICH HAS BEEN CONVENIENTLY PRE WIRED FOR SURROUND SOUND, COULD EASILY SERVE AS GAME ROOM/MEDIA ROOM, 5TH BEDROOM OR A PLAYROOM FOR THE KIDS. JUST PICTURE A QUIET SUMMER’S EVENING RELAXING ON THE FRONT PORCH OR HOSTING FAMILY AND FRIENDS FOR A BARBECUE IN THE LARGE PRIVATE BACK YARD. THE POSSIBILITIES ARE ENDLESS. WELCOME HOME! Send me more information about the listing at 1605 Teton, Chesapeake, VA 23320, MLS# 10239485. This 5 bedroom, 3 bathroom home located at 1605 Teton, Chesapeake, VA 23320 has approximately 3,056 square feet. It is currently listed for 430000.00 and has a price per sqft of $14,071. This home is currently Active under the MLS#: 10239485. It is listed by Coldwell Banker Professional Realtors. 1605 Teton, Chesapeake was built in 2015. It has Garage Att 2 Car, Driveway Spc parking. The kitchen includes Dishwasher, Disposal, Dryer Hookup, Energy Star Appliance(s), Microwave, Gas Range, Refrigerator, Washer Hookup. 1605 Teton is part of the Elbow Estates neighborhood located in 23320.